Michigan has what is known as “strict liability” for the victims of a dog attack. As long as the attack is unprovoked, the victim is entitled to damages from the dog’s owner. It is important to report any dog attack to your local police. Most police departments have specialists or animal control officers who investigate these claims. By reporting the attack to local authorities, you may prevent others from being injured. It is also important to seek prompt medical care, take photographs of your injuries and document your losses. 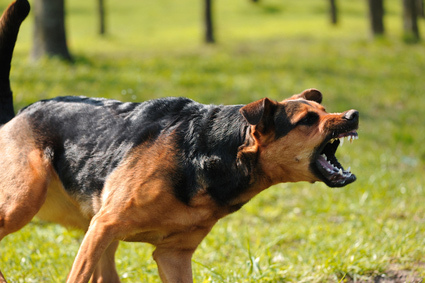 There is a three year statute of limitations for a dog bite claim in Michigan; however, it is advisable to get a consultation from a specialist in this field, like attorney James Giffels, as soon as possible. Attorney Giffels’ experience in this area includes a $250,000 judgment against a dog owner; a $150,000 settlement for a woman who was bitten on her arm; and a $100,000 settlement for a young girl who was bitten by a neighborhood dog. An experienced and aggressive attorney familiar with the insurance industry is what you need to maximize your case value. Call today for a free consultation and find out what your rights are. Dog owners have a duty to ensure that their dog does not attack and injure people. In Michigan the law makes dog owners strictly liable if their dog attacks someone. The only defense to a dog attack is if you have provoked the dog. While some breeds have been singled out as being particularly vicious, any dog breed can be dangerous. Although larger dogs are capable of causing greater injury, small dogs may be the most prone to bite. It may seem from news reports that certain breeds of dogs are more prone to bite or attack, but nearly any breed can cause injuries. If you have been attacked by a dog, you should call a dog bite attorney with the experience and expertise for seeking compensation for medical and other costs related to your injuries. If you or someone you know has been attacked by a dog, you need an experienced trial attorney on your side. You need an attorney who is not afraid to go to court. Attorney Giffels has received numerous awards for his trial successes. Michigan has strict liability for dog attacks, therefore, you may be able to collect compensation for medical expenses, lost wages (if you had to miss work), pain and suffering and scars. If you work with our firm, Attorney Giffels can figure out the exact compensation you are entitled to receive. What if I was bitten by a friend or neighbor’s dog? Many people are bitten by dogs they know – pets owned by family members and friends. This can put you in a difficult, and often uncomfortable, situation. However, you need to know that it is the dog owner’s insurance company you will be dealing with. The dog owner will not have to pay out of their own pocket. In Michigan, the local animal control department will make that determination. You should always report a dog attack to make sure that Animal Control knows about potentially dangerous animals. What if I was bitten while working at someone’s house? If someone asks or hires you to perform work on their property, it is the property owner’s legal responsibility to keep you reasonably safe from harm. It is the dog owner’s responsibility to take care of their animal. If they own a dog, this means they have to tell you about it and sometimes may have to keep the dog confined. You should contact an experienced injury attorney if you were bitten by a dog while working at someone’s home. What if I am not sure who owns the dog that bit me? If you were bitten by a dog and are not sure who the owner is, you should report the incident to animal control as soon as possible. You will have to give them a complete description of the dog so they can try to locate the dog and its owner. If they are unable to find the dog, you may have to get shots for rabies.